Well, almost there with my exam looming tomorrow. Eight months of study has flown by and I have found much to puzzle and much to intrigue amongst the pages of the OU Oceanography textbooks, but non which delighted me so much as my old 1950s book on the plankton of the open ocean which I've read at least three times over the years, gazing at it's beautiful hand drawn plates. 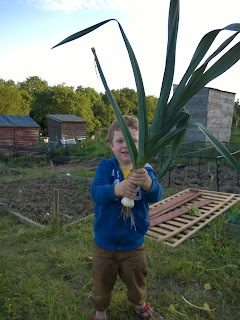 My brain is firmly shut down now from over revision, so I leave you with this random picture from this week of Toby with the enormous leek he proudly harvested.